Meticulously crafted from premium materials, the B27 Fancy-Stitch Lined Dress Belt from DeSantis is the perfect tactical addition to any formal wardrobe. 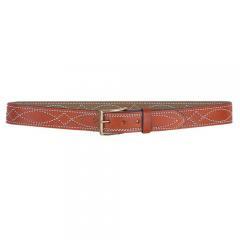 Fashioned from extra-heavy saddle leather, the belt is as durable as it is attractive. The leather is tanned and colored to perfection while a decorative stitch pattern gives it an extra splash of flair. Its robust construction easily supports the weight of a holstered sidearm without bending, adding to the belt's tactical functionality. The belt's backing is satin lined to prevent damage to pants or clothes. A removable buckle allows wearers to customize the B27 for any situation.